Alex 'Sleepy' Stein was a pioneer jazz disc jockey and a familiar voice on the Los Angeles radio dial for many years. 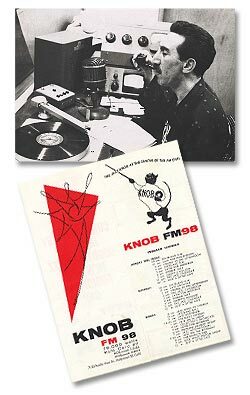 After a stint at KFOX including broadcasts from the Lighthouse Cafe, Sleepy started KNOB, the first all jazz radio station in the world. The Stein Collection features large scrapbooks that document his career including detailed coverage of the birth and growth of KNOB. The collection also includes photographs and reel to reel tapes featuring air checks and on-air interviews. Jimmie Baker was a pioneer television producer for ABC and was responsible for two important programs that were based in Los Angeles: Stars of Jazz (1956-1958) and Jazz Scene U.S.A. (1962) The Baker archive features a nearly complete collection of audio from both series on reel to reel tape and 16" transcription discs. The Donald Dean Collection features over 700,000 photographic prints and negatives documenting both the southern and northern California scene from the mid 1960s through the late 1990s. The Dean collection also includes reel to reel tapes of Sunday sessions at The Lighthouse that he recorded between 1952 and 1955. The Tom Lord Collection features hundreds of hours of radio broadcasts, transcriptions, test pressings, live performances and studio sessions all stored on reel to reel tapes. Tom Lord was one of a group of early jazz enthusiasts that started seriously collecting records and documenting sessions beginning in the 1930s. Tom Lord also became the world's foremost authority on Clarence Williams and amassed a complete collection of his recordings which are now part of the Institute's holdings. In 1976 Tom Lord wrote the definitive Clarence Williams Bio-Discography. The Bob Andrews Collection consists of a number of open reel tapes which document the Los Angeles Jazz Scene of the 1950s. 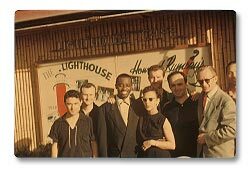 Andrews took his portable tape recorder to venues such as The Lighthouse, The Trade Winds and The Haig beginning as early as 1951 and captured numerous live performances featuring Art Pepper, Shorty Rogers, The Lighthouse All-Stars, Maynard Ferguson, Charlie Parker, Stan Getz, Gerry Mulligan, Jack Montrose, Hampton Hawes . . . Another highlight of the Andrews collection is several hours of audio from jazz performances on television including the Steve Allen Tonight Show, Stars of Jazz and various L.A. local broadcasts. The John Irwin Collection is one of the most comprehensive collections of jazz periodicals in the world containing close to 8,000 magazines, journals and newsletters. Included are complete or near-complete runs of most jazz related magazines dating back to the 1930s. In addition to the many American publications, there are a large number of rare British and European titles from the 1920s to the present. The Irwin Collection also contains numerous discographical research publications going back to the 1940s. The Robert Aurthur Archive consists of a large collection of rare 78 rpm records and test pressings from the 1920s and 1930s. Robert Aurthur was a respected author as well as a writer and producer for film and television. During the 1930s and 40s he was based in New York City where he frequented the jazz clubs and began collecting records. He was an assistant editor for Art Hode's magazine 'The Jazz Record' and also worked closely with Rudi Blesh and his 'Circle' label. The Weisenberg Archive includes a large collection of recordings and video tapes plus numerous photographs and promotional items. 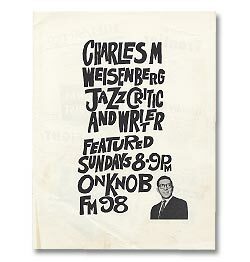 The Collection also includes materials from his radio programs on the legendary KNOB. 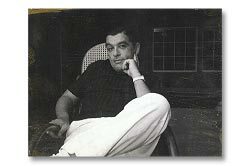 The Ray Avery Collection consists of recordings in all formats including several hours of unissued broadcasts and live performances. The collection also includes autographs, magazines and hundreds of pieces of jazz memorabilia in all categories. Ray Avery is remembered as one of the pioneer Jazz record retailers and most importantly a gifted photographer who did much to document the Los Angeles jazz scene. He opened his first jazz record shop, The Record Roundup, in 1947 and ended his retail experience at Ray Avery's Rare Records in 1986. The record retail business allowed Ray the time to pursue his interest in jazz photography in earnest. His shop in Glendale became the 'Mecca' for the serious jazz record collector. Record industry professionals and musicians were frequent visitors to the shop. Friendships developed which led to invitations to recording sessions, jazz concerts and parties for jazz musicians. Ray traces his first jazz photos to the early 1950's. Many of his early photographs document the birth of West Coast jazz and the artists who defined this period in jazz. Ray and his cameras had been in attendance at all but one of the Monterey Jazz festivals since it's inception. He also attended several Nice, France jazz festivals, one of the official photographer's for the Stars of Jazz television series, all of the Los Angeles Classic Jazz festivals, ten years of covering the New Orleans Jazz & Heritage festivals, and the North Sea Jazz festivals in Holland. His photographs have appeared in over 100 jazz books, over 150 LP covers, over 100 CD covers and numerous jazz film documentaries. 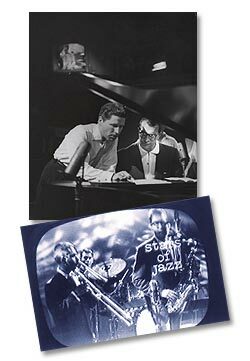 The Ken Poston collection consists of thousands of recordings in all categories, books, magazines, autographs, photographs, films, interviews, correspondence, research materials, programs, posters, and a huge collection of jazz related memorabilia. Poston had been a serious researcher and collector for over 20 years before creating the Los Angeles Jazz Institute in 1999. The Poston collection forms the bulk of the Institute's holdings. For biography see "Director"
The Los Angeles Jazz Institute welcomes and encourages donations and bequests of materials including records, books, magazines and other items related to jazz and big bands. We are especially interested in acquiring items that document the Los Angeles jazz scene from the turn of the century to the present. This includes tape recordings of radio and television broadcasts, home recordings of live perfomances, photographs of artists and venues (we especially need photos of the exteriors of jazz clubs and ballrooms). We are also interested in any and all types of memorabilia including scrapbooks, programs, tickets and related advertising items. The Los Angeles Jazz Institute is a 501 c3, tax exempt, public benefit corporation. All donations are tax-deductible.